For some time now, researchers have found that children of more talkative mothers have larger vocabularies than children of quieter moms (studies at the University of Chicago showed as much as a 400% difference among two year olds). It’s important to recognize that the nature of the speech is important: to yield the language and vocabulary benefits, it must be directed at the child (child-directed speech). Words heard in the background such as on a TV do not result in improved language acquisition for younger children, and indeed TV has been found to be detrimental to language development for children under 2 years old, quite likely because it distracts caregivers and results in less overall child-directed speech. Language is particularly important for overall early childhood development since it is such a critical foundational building block for other academic and social-emotional learning. With speech, a child can articulate and build on her memories, explore relationships in her world, and build deeper connections with people around her. It is one of the reasons that Baby Sign Language is so appealing in developing early communication. Pronunciation and Emphasis, measured in length (“dooog” v. “dog”) and intensity/focus on the word in speech. Higher pitch was also more effective, reinforcing the hypothesis that “parentese” helps kids learn words. Average length of sentences containing that word – the shorter (generally less complex) the sentence, the more likely the child was to learn the words. Perhaps surprisingly to many of us parents: the child’s nanny was more effective than both the mother and father in encouraging the child to learn new words (even controlling for the amount of language heard from each of the three primary childcare providers). 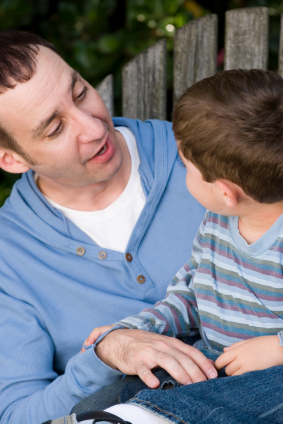 Talk with your child: all the time, any time! Talk even when you don’t need to, like on walks or in the car. Even before your child can speak, describe the things around you and whatever inspires you. When he can express interests, try to choose topics that relate to his focus. If it helps for inspiration, choose a random topic of the day and find pictures or other opportunities to discuss the chosen subject. Likewise, seek out a caregiver – nanny, babysitter, or day care provider – who is naturally talkative. When doing reference checks with other parents who’ve employed the person, ask about whether they would characterize the provider as talkative with kids. In particular, respond to your baby’s babbles, when they’re particularly receptive to learning language. Focus on the objects that are likely gaining the attention of the child, rather than trying to interpret the sound of the babble. Entry filed under: Childcare & Schools, Language, Research. Tags: caregiver, child care, child directed speech, childcare, communication, day care, early childhood development, language, nanny, parentese, sign language, speech, talkative, vocabulary.